I like tinkering with gear, especially outdoor cooking gear, and especially especially stoves. Lately, I’ve been experimenting with wood-burning camp stoves. Since starting with Cub Scouts nearly 5 years ago, we have done most of our camping with the Scouts, and that sort of cooking is big group cooking. Sometimes, it’s BIG group cooking. Like 75 to 85 people big. Like two 18 liter stock pots of chili at one time (there’s a reason my big chili recipe is called “Chili for 75”, and I’ll post it up here sometime — but not now) on a giant 3-burner propane camping stove. But, on the occasional solo or small trip, I like to do some cooking. I’ve been known to cook over an open fire, and I love doing that with my dutch oven and cast iron skillets, but sometimes I like a small stove or I don’t have room for the big cast iron cookware. I also used to do a lot of backpacking (more than 10 years ago — before The Boy came along). Back in my backpacking days, I use an MSR Whisperlite (original) and later an MSR Dragonfly (searching for better simmering), both powered by white gas (“Coleman fuel” to you old-timers). They can be messy and finicky (and LOUD), but man can they boil some water quickly! Later, I got lazier and switch to canister fuel stoves (easier to deal with, simmered better most of the time, still boil water like a champ). I also have used some alcohol stoves (and even made a few). Slower to boil, but lighter, quieter, and easier to use. But, lately, I’ve been interested in wood-burning stoves. Clarke Green over at the Scoutmaster Blog and Podcast has had several great posts about the environmental impact of cannister stoves versus wood-burning stoves, including this one with the nice infographic and excellent discussion in the comments. In addition to not carrying flammable fuel (white gas, cannister propane or isobutane, or alcohol) in your pack or canoe, there are no cannisters to attempt to recycle and no petroleum impact of your fuel (though the same can’t be said of your stove unless you’re cooking over an open fire). I think wood-burning stoves are cheaper (in the long run, anyway), safer, and more fun. I’m a big fan of campfires and cooking over fire. Even taking Leave No Trace values into consideration, you can still use a wood-burning stove to cook your meals on and provide some cheery comfort. LNT doesn’t say “no fires,” it says, “minimize campfire impact,” which is easy to do with a little practice. Even where you can’t build a campfire, you can often cook in a woodburning stove (check regulations for your area, though). 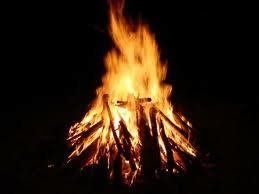 And you can use it as as small campfire, too, which helps maintain the PMA (Positive Mental Attitude) while camping. Many wood-buring campstoves are double-walled wood gas stoves that incorporate secondary burning to eliminate much of the smoke from a wood fire and also to burn the wood more efficiently, which makes you use less fuel to cook your meals and also leaves you with less waste (usually just a handful of ash). 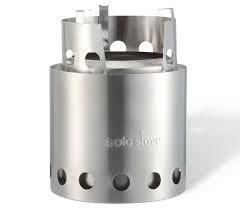 I recently purchased a Solo Stove that is built like that. I’ve done a couple of test burns in the Solo Stove, and I really like it. Burns very efficiently, is light enough (not UL by any stretch of the imagination at 8.7 ounces), and is fun to cook with. It also nests perfects (in its stuff sack) inside my IMUSA 12CM pot (like Shug’s “Hillbilly Pot”), which is my new favorite camping cookpot (more on that in another post). Clarke Green’s troop uses the Solo Stove (which I think is where I first read about it) when backpacking, and they use a larger wood burning stove model when car or canoe camping for group cooking. See the post of his I linked above for links to his review of the Solo Stove and other wood-burning stoves. I’ve also got an original Emberlit, which is a single-walled wood-buring stove. I like the Emberlit, but it’s a bit fussy, and I find I get soot on me while assembling and disassembling it. Maybe it’s my technique. Very cool design, though. I think I prefer the Solo Stove for my purposes. I think firebuilding is a core Scout and outdoorsman skill that should be learned in lots of different conditions and should be maintained. It’s a great confidence builder for anyone, but especially for Scouts (The Boy is justifiably proud of his firebuilding skills, even at his young age). Building a fire in a wood-burning camping stove like the Solo Stove or the Emberlit reinforces the core firebuilding skills.